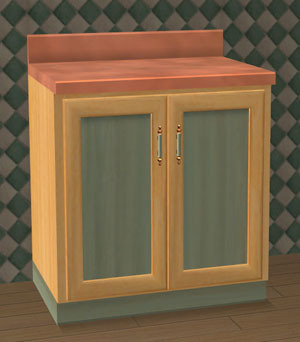 This is a complete kitchen counter and cabinet collection. 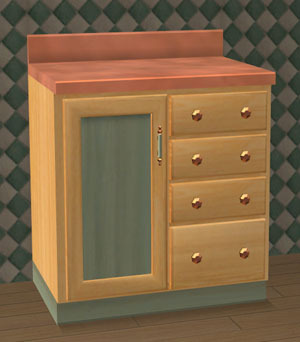 There are 6 counters, 7 cabinets and an island included. All are fully recolorable and share the same textures. Recolor one and you've recolored them all. Added 7th June 2005: Texture templates for the set. There are 3 files in the texture templates zip file. There is a Photoshop PSD file which includes the wireframe and a layer called "shading" which holds all the shadows I used for my textures... I thought that might be useful to some. Also included are 2 PNG format files of the template, one sized 1024x1024 and one sized 512x512. All final textures should be scaled to 512x512 before importing to the game, but I find it easier to work with a big image and then reduce the scale. 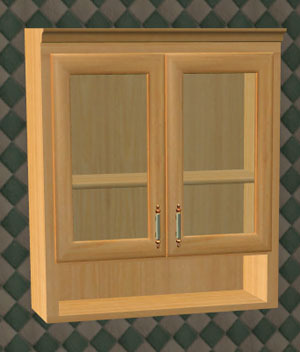 An additional upper cabinet (it goes above the regular cabinets) by Aimoss can be found here. Thanks for sharing it, Aimoss. Update 10 April: If you are not using the University EP, please download the additional zip file called RGiles_Counter_Thyme-UPDATED.zip and use the RGiles_Counter_Thyme.package file included instead of the one in the original download. This file will work for both University and the Original game, but if you're using Uni you don't really need to update unless you feel like it. This version of the package will not crash the Original game. Any recolors will still work just fine after the update. 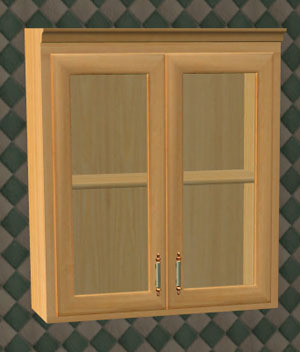 Upper cabinet door fronts can have their color changed independently of the rest of the cabinet. 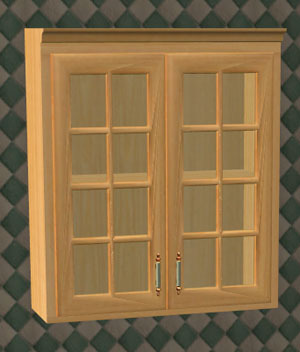 This is so I could include glass doors as well as wood ones. 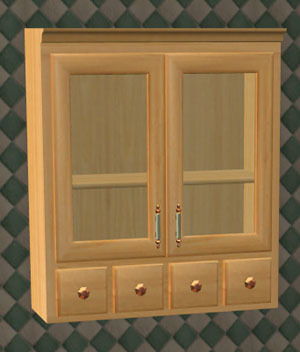 Cabinets are decorative only, and you'll find them under wallhangings. 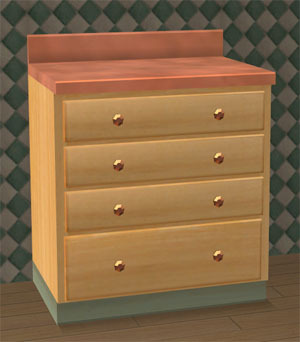 2 textures are included at the moment: the one pictured and a second which is dark wood with gold accents. A texture template will be uploaded soon-ish. All objects are well below the Maxis guidelines for vertex count, and don't seem to slow down my game at all... for those who worry about that. Unzip to your downloads folder or any subdirectory of it. 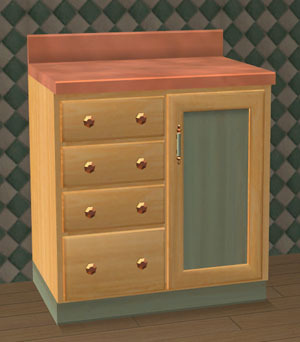 includes the master textures and must be installed for any of the other parts to work. 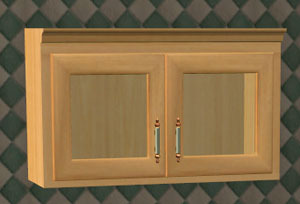 is required for any of the cabinets to work properly. a stove exhaust fan that fits under the half-height Parsley cabinet and a set of mugs to keep in the open Rosemary display cabinet. Both are shown in the screenshot of the full collection. 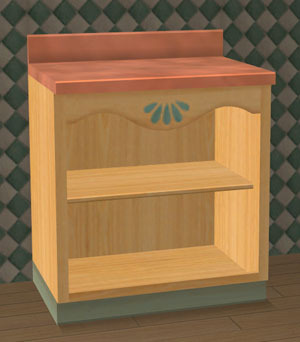 Stuff to put on the shelves of all the cabinets and the one open counter. These will use the cose for the rugs so that they can be placed in the same tile as something else without moveobjects on. The glass doors really aren't too useful with nothing on the shelves. Suggestions are welcome, but may not be practical. You may use, recolor, clone, hack to bits, or wear these files in your pants. Recolors and clones can be shared on this or any other free site. If you think of it, please let me know where you've posted a recolor. You may not share any clones, recolors or derivatives of these objects on any pay site unless it it a section that's always free. Free rotation does not count. You may not sell these files as a part of any collection. You may of course wear them in your pants while browsing a pay site. Please do not share the originals on other free sites while they are in beta testing. And as always, avoid sharing any beta items with lots. Huge thanks to Quaxi, Miche and Delphy for SimPE and the Mesh tool, without which none of these objects would be possible. 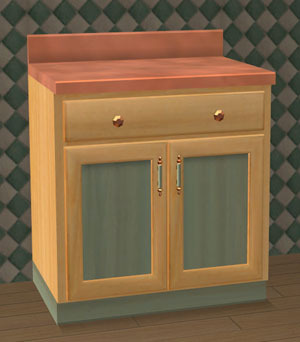 Counter tops for all counters are maxis originals (it's not possible to fully replace them yet, so I didn't.) Thank you to everyone who has contributed to our understanding of how mesh and textures work in the game. Far more people than I could possible name, so I won't even try. 2588 people have said thanks to RGiles for this download.